Click one of the buttons below to expand and view our information. The Title I, Part A program is designed to help disadvantaged children meet high academic standards by participating in either a school wide or a targeted assistance program. Schoolwide programs are implemented in high-poverty schools following a year of planning with external technical assistance and use Title I funds to upgrade the entire educational program of the school. Targeted assistance programs provide supplementary instruction to children who are failing or most at risk of failing to meet the district’s core academic curriculum standards. School-based decision-making, professional development, and parent involvement are important components of each district’s Title I, Part A program. At Saginaw Public Schools, all schools except Handley PCAT, Saginaw Arts & Sciences Academy, and Saginaw Career Complex receive Title I funds. Funds are also received at the district level. For more information about the Title I program, visit the Michigan Department of Education’s Title I A information page: http://www.michigan.gov/mde/0,4615,7-140-5236_6048-69709–,00.html. The Title II, Part A Improving Teacher Quality Competitive Grants Program provides funding to partnerships of higher education departments of teacher education, higher education departments of arts and sciences, and high-need local education agencies. The purpose of the partnerships is providing professional learning opportunities to teachers, principals and paraprofessionals, which will result in increased learning for all students. The Office of Professional Preparation Services administers this program, providing applications, coordinating reviews of the competitive proposals, awarding funds to selected projects, and monitoring the projects’ activities and expenditures. For more information, please visit the District’s Professional Development page. Title III – Language Instruction for Limited English Proficient and Immigrant Students. The Title III program is designed to assure speedy acquisition of English language proficiency, assist students to achieve in the core academic subjects, and to assist students to meet State standards. It also provides immigrant students with high quality instruction to meet challenging State standards, and assists the transition of immigrant children and youth into American society. For more information on the Title III program, please visit the Michigan Department of Education’s Title III website:http://www.michigan.gov/mde/0,4615,7-140-6530_30334_40078—,00.html. Section 31a of the State School Aid Act provides funding to eligible districts for supplementary instructional and pupil support services for pupils who meet the at-risk criteria specified in the legislation. These criteria include low achievement on MEAP tests in mathematics, reading or science; failure to meet core academic curricular objectives in English language arts or mathematics (applies to grade K-3 pupils only); or the presence of two or more identified at-risk factors. The funds may also be used for class size reductions in grades 1-6 in schools above the district’s poverty percentage. Section 31a funds are limited to direct services to pupils and may not be used for administrative or other related costs.At Saginaw Public Schools, only Arthur Hill High School and Saginaw High School receive Section 31a funds. Funds are also received at the district level and are used to help fund the Birth Through Five program and security. More information is available at the Michigan Department of Education’s Section 31a page:http://www.michigan.gov/mde/0,1607,7-140-6530_30334-43638–,00.html. Welcome to the Saginaw Public Schools Safe Schools/Healthy Students (SS/HS) Initiative! The common mission of the Saginaw Public Schools Safe Schools Healthy Students Initiative through school-family and community partnerships and collaboration is to promote, implement and sustain a healthy and safe environment, which supports academic achievement and student success. The overall vision of the Safe Schools Healthy Students initiative is to integrate systems that promote the healthy development of children and families in a safe, healthy and drug-free school and community environment. Saginaw Public Schools has been selected as one of three Michigan pilot communities to implement the four year Safe Schools/Healthy Students (SS/HS) grant through the U.S. Substance Abuse and Mental Health Services Administration (SAMHSA) and the Michigan Department of Education and Michigan Department of Community Health. For more information on SAMHSA’s federal Safe Schools/Healthy Students Initiative:http://www.sshs.samhsa.gov/. Developing children’s social and emotional skills that will lay the foundation for future healthy interpersonal relationships, association with non violent peers, and improved academic achievement. Enhancing an individual’s ability to achieve developmentally appropriate tasks and a positive sense of self-esteem, mastery, and well-being and to strengthen their ability to cope with adversity through enhanced integration, coordination, and resource sharing. Linking families, schools, and communities together to increase and improve the quality of their engagement in planning and implementing programs and activities that assist students. Addressing the prevention or reduction of substance use in coordination with broader environmental strategies that address change not only at the individual, classroom, and school levels, but also at the family and community levels. Identifying and addressing issues, conditions, behaviors, and structures that contributes to unsafe school environments and violence in schools. 1. 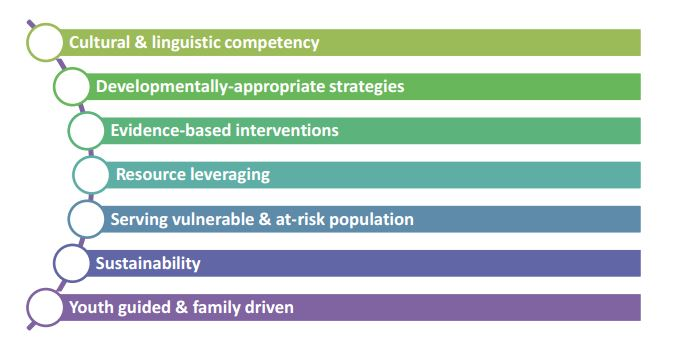 Cultural and linguistic competency: Ensuring that all programs and evaluations are appropriate for every culture group. Programs should value diversity and incorporate multiple cultural perspectives. Policies and strategies should support the cultivation of data to measure and address disparities. 2. Developmentally appropriate: Using prevention and intervention strategies and evidence-based programs that are valid and appropriate for a specific age group or developmental level. 3. Evidence-based interventions: Using a continuum of integrated policies, strategies, activities, and services whose effectiveness has been proven or informed by research. 4. Resource leveraging: Assessing and using existing resources and identifying the need for additional resources. 6. Sustainability: Using various strategies to maintain the positive outcomes of the SS/HS initiative and ensuring the ongoing support of programs and policies. 7. Youth guided and family driven: Ensuring that youth understand that change is possible, that systems serve them, and that they feel safe, cared for, valued, useful, and spiritually grounded. Ensuring that families have a primary decision making role in the care of their own children as well as the policies and procedures governing care for all children. 1. Capacity building: Strengthening the knowledge, abilities, and skills of individuals and improving organizational structures and processes to more efficiently meet the needs of the community in a sustainable way. 2. Collaboration and partnership: Involving multiple organizations and working together in sharing common vision, resources, goals and outcomes. 3. 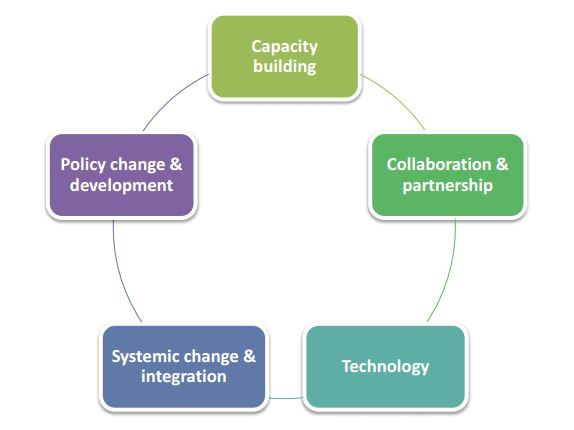 Policy change and development: Using existing or new lessons learned to inform the revision of current or the development of new state and local policies. 4. Systemic change and integration: Changing existing systems to better coordinate multiple service agencies and programs to improve outcomes for the target population. Systems change and integration is a natural product of collaborative activities. 5. Technology: Harnessing evolving technology to increase efficiency and support program implementation and evaluation. A very important part of this SS/HS Initiative is the evaluation of the programs and services being provided. The evaluation process requires the collection of data about students’ participation in the programs and services being offered. The data collected will help project staff to determine whether the programs and services offered are actually having a positive effect on students’ lives and the school’s environment. Data from schools and participating service providers will be used by Michigan Department of Education and the Michigan Department of Community Health to evaluate the project. No individually identifiable information (e.g., student names, addresses, etc.) will be made available to the Local Evaluation Team. All data is collected and assessed as group data. A summary of the projectΓÇÖs combined program results and progress will be available to the community. The information contained in these topics is not intended nor implied to be a substitute for professional medical advice. Saginaw Public Schools provides general information for educational purposes only. Saginaw Public Schools does not recommend or endorse any specific tests, opinions, or other information that may be provided on the linked resources. If you believe your child is experiencing a medical emergency, you should immediately call 911 or your physician. External links open as PDF document in new window. For information regarding State & Federal Programs please use the appropriate contact below.